Leeds, UK - 4B Braime Components Ltd., a worldwide manufacturer of material handling and electronic components, has just released the all new fourth generation Watchdog™ control unit for monitoring bucket elevators and conveyors. The Watchdog™ Super Elite (WDC4) is easy to install and simple to set-up. The system processes signals from up to 15 sensors for belt speed, belt misalignment, continuous bearing temperature, pulley misalignment and plug conditions on bucket elevators or conveyors. When an alarm condition is detected the system will log the details, sound an alarm and provide shutdown control of the elevator/conveyor and feeding system. A new 3.5” colour graphic LCD screen displays the entire system status at a glance. The WDC4 model now supports belt speed monitoring for variable frequency drives (VFD’s), and belt misalignment inputs for contact, pulse and temperature (brass rub block) sensors. The WDC4 also has jog and acceleration monitoring for detecting any equipment issues during the start-up sequence. The controller settings are password protected, and can be set up either directly on the LCD screen, or by a free PC software application and transferred to the WDC4 via an SD card. 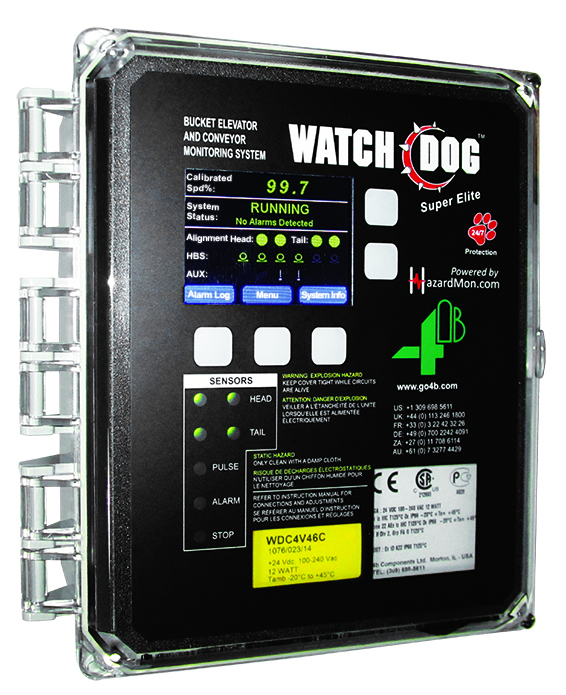 The Watchdog™ Super Elite can be connected directly to a PLC using Modbus TCP/IP protocol, or integrated into HazardMon.com®. HazardMon.com is a secure cloud based solution that provides live system status, graphs and historical data that is viewable on any web-enabled device (smartphone, tablet, desktop PC). The Watchdog System is approved to the following explosive atmosphere standards: ATEX (EU), CSA (USA), IECEx (SE Asia and Australia), InMetro (Brasil) and Nepsi (China).